I have 2 swords that appear to have been made in Dublin. The first sword has a makers mark on the blade of "Gowes & Woodward James Street Dublin" On the other side of the blade is a proof mark inside a floral design.The blade is 34 1/4 inches long and the grip is wrapped in fish skin with braided wire. The guard appears to be iron or steel. The scabbard is bright steel. 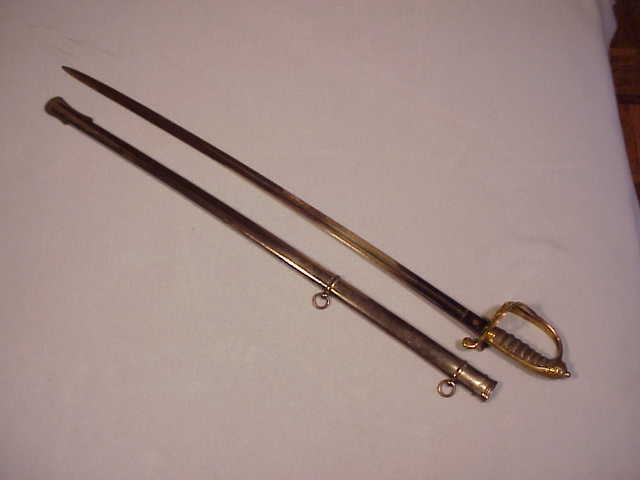 The second sword has a very faint makers mark that appears to be "McEmbrs Richardson and Dawson. address is illegible but Dublin can be made out. The blade is 32 inches long. The proof mark on the opposite side is contained within a 6 point star.The scabbard is leather with brass fittings and the grip is wrapped in fish skin and braided wire. The guard appears to be brass and contains a coat of arms. Can anyone provide me with any information about the age and possible history of these blades? I've found a listing for Ireland	Dublin	Clowes & Woodward	1859	1888	27 Dame St. I own no books on UK swords and am simply accessing the www.oldswords.com site. No doubt, these will turn out to be tailors/retailers rather than the makers but pictures of the proof marks/discs can sometimes place them to the origins. If one is an 1845 type (the former), the insignia in the guard may show an Irish motif? Thanks for the info GC. 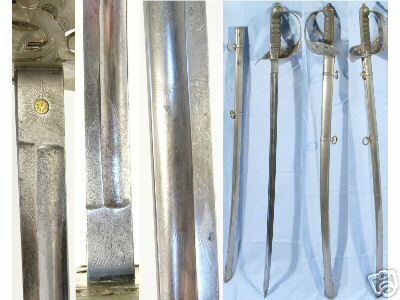 It has been a bit of an adventure trying to find info on these swords. The history behind them is that they were the property of the father of a childhood friend who is now in the process of retiring to British Columbia and does not wish to keep them. The father, Capt. Harvey Bell was a Great Lakes tugboat captain whose family and whose wife's family came from Ireland. There apparently was a strong military connection and the original immigrants to Canada were retired military men. They established themselves in the Bruce Penninsula, and over time became lighthouse keepers and coal merchants. The date you suggest for the sword fits with the main wave of Irish immigrants to Canada. And the adventure continues.